5793 labyrinths found. Showing 4281-4300. Sorted by country, state, city, then zip/postal code. Two and a half blocks South of Washington Square Park in Greenwich Village. 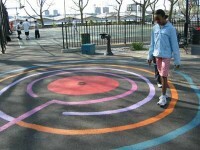 7-circuit Rainbow-Chakra Labyrinth is available after school hours during the week from 2:30 PM. Best for small people. e-mail contact for summer hours. Designer conceived to assist persons and communities bridge divisions within the self, communities, societies and the world. DeWitt Clinton Park is a 5.8 acre New York City public park between West 52nd Street and 54th Street (Manhattan) and Eleventh Avenue (Manhattan) and the West Side Highway in Manhattan. Two labyrinths exist in this park, one in the children's playground and one on the path surrounding the park at it's north west corner. 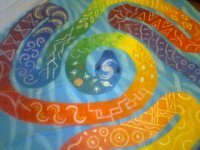 This is a rainbow serpent labyrinth painted on canvas with acrylic paint and a blue wash background, designed by Crow Mitchell. it has three circuits and seven chakra colors as well as the milky way Jupiter, Saturn, stars and Mars along with ancient symbols. It is a powerful and dynamic meditation/walk, available for use in indoor or outdoor space by appointment. Vera DeCicco is the owner and is working with various locations throughout New York City and Brooklyn, indoors and outdoors in public parks. A rainbow serpent designed with the seven colors of the chakras repeated three times once for each circuit. It is vibrant and alive with a movement all it's own. I visited this school to give a presentation for the teachers. To my delight, I was invited to walk the labyrinth in the basement. Aromatherapy and candlelight enhanced the soothing and centering experience. A wonderful surprise! 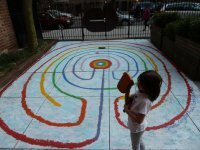 Find The Labyrinth for Contemplation just north of Castle Clinton in Battery Park at the tip of Manhattan. This was commissioned for the first anniversary of September 11th. 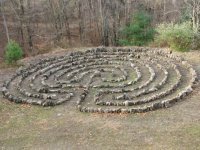 The Labyrinth for Contemplation is a seven circuit labyrinth with a circular center. The paths are 3 feet wide. Installed in 2005 as the floor on the main level of the columbarium under the main church bell tower. While you are welcome to view this labyrinth, it is too small to actually walk. 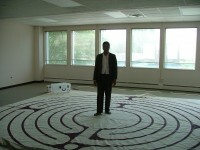 access to the labyrinth is available most days and for all church events. Call the church office to verify 212-288-4100 or visit website www.stjames.org. Each season we create a new natural outdoor art labyrinth. Littletree Orchards is a U-pick orchard open to the public. More information can be found on our website. The public is welcome to visit when the orchards are open: daily July 1 to Nov 15, from 10 am - 6 pm. Please contact us ahead of time to make arrangements if you wish to visit at other times or for a private booking. This labyrinth is open to the public during business hours. This labyrinth is located on the grounds of St. Francis - formerly St. Mark's - Episcopal Church. If you park in the church's lot just off Bellmore Avenue, walk back into the grounds away from the road, passing our organic vegetable garden (proceeds given to the LI Council of Churches Food Pantry in Freeport), and find the labyrinth at the furthest extent of our property. Please come any time you like. This pretty sand-and-stone labyrinth is on the top of the ski mountain, accessible by a gondola ride up. While walking it one is treated to a sweeping view of the Adirondack Mountains. The labyrinth is covered over by snow during ski season. The labyrinth is on Gore Mountain, which is owned by New York state (http://www.gorechamber.com). 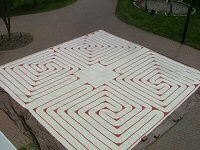 In the style of the Medieval Labyrinth (also known as Chartres, cathedral or eleven-path/circuit) first developed during the ninth and tenth centuries CE. As you face the main building, turn to the right & you will find signs pointing you to the labyrinth. It is not necessarily visible after a snowfall. It is owned by the Powell House conference and retreat center, run by the Religious Society of Friends (Quaker). They are fairly welcoming, but do sometimes have conferences using the facility, so calling in advance would be a good idea.